Make your own iPad for $400!! It can’t get any geekier than this! If you are like me who likes to make their own thing rather than buying it off the shelf, this is for you! Now you can make your own iPad styled tablet for just $400. 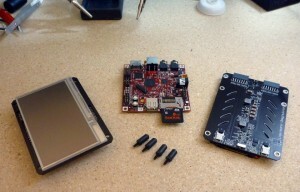 Liquidware an open source hardware company is sporting a $400 tablet starter kit! This kit is intended to target developers who want to create a tablet and write software applications for the same however its uses are endless. Called the “Beagle tablet” is a modular portable open source hand held computer. Its completely customizable and has a plugin module base board where you can plugin additional hardware that you may work on. This level of customization is incredibile. The kit is nice! 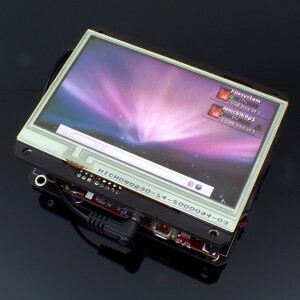 It contains a 4.3 inch OLED touchscreen that mounts directly on to the BeagleBoard. The board is a single board computer from Texas instruments and comes with a 1-GHz processor. It comes with a 4-GB SD card with Angstrom Linux to boot the system and also includes a battery module. There is no reason why users may not be able to run the Android operating system on it. Since the Apple iPad the industry has gone all out to grab the tablet market. The Beagle tablet is ideal for folks who want customization. With the iPad you cannot add, for instance a temperature sensor but with the Beagle tablet its a matter of just plugging in the temperature module and programming it to read the same. Since the Beagle table does not have any inbuild storage beyond the SD card, it is extremely lightweight and weights just about 8 ounces. It also has on-board USB ports so users can plug in an external hard drive or add in a higher capacity SD card. The battery life is decent and varies from three to six hours depending on its application. The Beagle tablet is ideal for projects where iPad would not be the best option. Want to have a touch screen kiosk in your kitchen? May be your car? Something that you can customize at your own free will? Beagle tablet is the way to go. Check out this video of an iPad being hooked in a car. You can visit liquidware to buy one here. iPad lawsuit? Class Action Lawsuit against iPad filed! Turn your iPad into a iMac!